Researchers at Stanford have made mice glow using a new gene therapy technique, showing that the process can work on living animals. 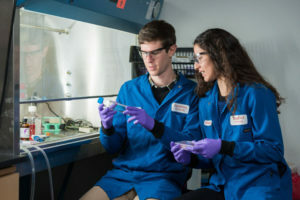 Named charge-altering releasable transporters (CARTs), the new technique allows researchers to control how much of a desired protein is expressed inside a cell, and how long the gene therapy lasts. It has a variety of applications to many central problems in biology and medicine, including immunology and cancer research. Previous gene therapy techniques have relied on permanently changing the DNA within a cell. Colin McKinlay, a third-year Ph.D. student in chemistry and co-lead author on the paper, explains that CARTs take advantage of messenger RNA (mRNA) rather than DNA to give researchers greater control over the process. However, mRNA molecules are too large to enter the cell on their own. CARTs are able to latch onto the mRNA, cross the cell membrane, release the mRNA into the cell and quickly degrade into small molecules called metabolites naturally recognizable by the cell. After that, the cell takes over, translating the mRNA into the desired proteins. One possible application of the new gene therapy technique is creating new types of vaccinations. Typical vaccination techniques involve introducing a dead or weakened antigen, bacteria and foreign substances such as viruses into the cell, which the body then uses to create antibodies. CARTs could allow researchers to temporarily introduce specific proteins from the antigens into cells in order to specify targets for the immune system that are less sensitive to antigen mutation. CARTs also have the potential to be used as a research tool. As transient polycations, CARTs allow proteins to be introduced and manufactured by the cell in controlled quantities and for a controlled amount of time, making them a valuable resource for studying signaling cascades and other biological phenomena. The team behind CARTs primarily consists of Wender and Waymouth Group researchers, and also draws on collaborators across Stanford. As the team begins to test the potential applications of CARTs, more researchers are expected to come on board. In their recent paper on bioluminescent proteins in mice, researchers worked with Christopher Contag, a professor of pediatrics at Stanford, to show that the technique can work in vivo in animal models, bringing the team a step closer to using it in humans.